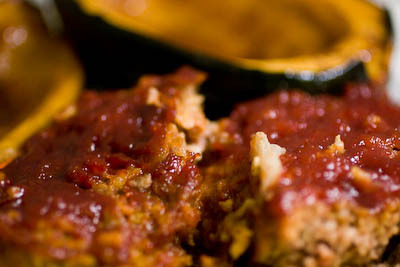 For last night we made a bison meatloaf and served it with baked acorn squash. Mix everything but the last two items in a large bowl. Spread into a 8×8″ glass baking pan. Mix the ketchup and brown sugar together and spread on top. Bake for 1 hour and a thermometer reads at least 160* in the center. Take a 9×13″ glass baking pan and fit the 6 halves into the pan, cut side up. Mix in a bowl or measuring cup the maple syrup, vineagr and lemon juice. Take a pastry brush and brush on some of the mixture over the cut surfaces. 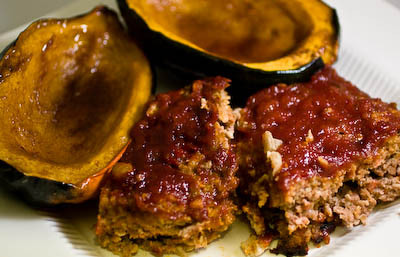 Bake for 20 minutes, then baste the squash with more of the mixture. Take the rest of the mixture and divide it between the 6 halves. Split the melted butter between them as well. Pit back in the oven for an hour more. Every 20 minutes (3 times) you will want to pull the squash out and baste again with the liquid. Squash are done when tender.